I had the honor of visiting Panama City for business spending four full days in this beautiful city enjoying its diverse look and culture. On the last full day of my trip, a very kind man attending the workshop offered to take me to old Panama City and give me a walking, talking tour. Driving out of Panama City to old Panama City he gave me a quick history lesson outlining the work the country is putting into the restoration of this beautiful city and all of the money private investors continued to pour into this beautiful city. They were tasked with restoring the city to its original charm ans style. We walked through many streets and he talked to multiple city workers asking which roads were open that we could walk use in our journey. I could spend months if not years photographing this historic town and realized immediately that I needed to do everything possible to capture a piece of this city's splendor. We walked to this street initially to tour and photograph the monastery (left side of the frame) but found it closed and locked for the night. However, I couldn't pass this beautiful view and immediately set-up my tripod to begin composing the scene. As soon as I began setting up a lady walked into the scene and sat down. At first I thought (please move one) but soon realized she was staying to feed some stray cats. In post processing I went more for the painterly look and the lady feeding the cats fit perfect in this stepping back in time look (the only thing out of place are the light post along the roadway (or are they)). Within the scene is another person - can you see him? He is not hid and in the near center of the image. Wouldn't it be great to shoot portraits or a wedding party in this grandeur old city? Can you imagine the shots possible for high school senior portraits? I wonder if the inhabitants of the area do the same thing that we do concerning the beauty in our back yard? Overlook it? Its summertime in North America and time to enjoy the beautiful countryside. 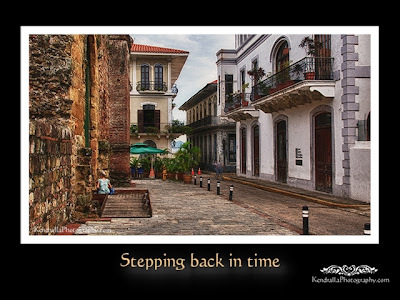 Take the time to visit old cities in your area and step back in time to days of old. While visiting these cities, do not forget to take your camera, note book documenting your visits as you record memories for future enjoyment. I state this often during a wedding or portrait session. Although these images are taken for your enjoyment, the real value is to capture this moment in time and for future generations to enjoy and cherish.